Specialist hydraulic bolt tensioning company Boltight is celebrating a successful first year as part of the Nord-Lock Group (Sweden). The company recently announced record annual sales, a growing order book and the opening of a brand new production facility. Bolitight's new 325 square metre modern production facility has been purpose-designed. It has been fitted out with production cells equipped with special assembly tools and pressure testing cabinets. Over the last 12 months Boltight has increased its turnover by over 50% by focusing on its pioneering product design and excellent customer service. The company's hydraulic bolt tensioning systems, which are used for demanding applications in the oil and gas, power generation, wind energy, industrial engineering, construction and mining industries, enjoy a global reputation for innovation and quality. Recent high profile orders include the supply of bespoke tools into the USA for use on power transformers. The project was supported by onsite training and completed in just six weeks. Another order involved the supply of large 3 1/2" and 6" diameter bespoke tools to UVIT in Italy for use on an ammonia converter plant. In June 2016, over 100 TSR spring return bolt tensioners, in various sizes, were shipped to Australia for topside applications in the oil and gas industry. To satisfy customer demand, the company has expanded its UK manufacturing operation with the opening of a new 325 square metre modern production facility at its base on the Junction 10 Business Park, Walsall. 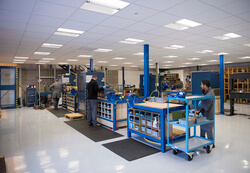 The purpose-designed space has been carefully fitted out to create a number of production cells equipped with special assembly tools and pressure testing cabinets. Said Phil Jarvis, Boltight's General Manager: "Since joining Nord-Lock our business has grown from strength to strength. Thanks to this support we have been able to invest in a dedicated production facility that will ensure we can continue to meet customer requirements going forward. We are in good health and excited by the opportunities that lie ahead." Boltight Limited is a division of the Nord-Lock Group, the world-leading provider in bolting solutions. Boltight is located in Walsall, West Midlands, UK.